That’s the first line in Alfred Hitchcock’s Lifeboat (1944), uttered by a man, just pulled out of the ocean, to a luminous Tallulah Bankhead. She wears a fur coat, and her hair remains meticulously coiffed—exactly as if a Nazi U-Boat had not sunk the ocean liner she was on. She also then announces that, as a Margaret Bourke-White-style journalist, she has captured their whole ordeal on film. When the man knocks her camera, full of “irreplaceable stuff,” into the water, she responds indignantly at first, and then seems to instantly recover. A couple years earlier, in 1942, Mrs. Miniver had shown audiences a different kind of strong woman during World War II. Set in a small village near London, this movie shows us the Miniver family as the war really begins to affect their lives, and Greer Garson plays the titular lady of the house. Watching this movie felt like revelation after revelation. I looked up Garson, wondering why I hadn’t seen any of her other movies. I looked up the date, stunned to find that it came out in the United States so soon after we had entered the war. I wondered how relevant it must have seemed to people who were experiencing similar events in real time, starting to view a new hat as a vice or wondering if they had enough sugar to make treats for their children. Knowing that Christopher Nolan’s Dunkirk would be coming out soon, I was immediately intrigued by Mr. Miniver being among the men who sailed off to ferry distressed British soldiers home on their leisure and fishing boats. It was something of a coincidence that I watched both these movies in a short period of time—I’ve been joking lately that maybe my true calling in life is to watch old movies and tweet about them. That might just be true, but I had never really thought before about the spectacular machine of Classic Hollywood chugging out naturalistic dramas in real time. It seems entirely counterintuitive to the magic usually ascribed to the Hollywood of that era. Sure, we now have films like Zero Dark Thirty (2012) and Lone Survivor (2013) that have addressed current conflicts, but both came years after those conflicts had been minimized both tactically and in the American media. More importantly, the home front presence is limited in these films primarily to weeping wives and phone calls home. Just as it has been entirely possible for contemporary Americans to ignore the ongoing conflicts in Iraq and Afghanistan, I cannot think of a movie that puts regular people, outside military service, in a situation like that which occurs in either of these movies from World War II. Argo (2012) is, perhaps, a recent exception, but it balances the damning reality that Iran is still unstable and potentially dangerous today with the high drama of the 1970s set piece. Turning back to World War II and these classic films, both Mrs. Miniver and the people in Lifeboat encounter an enemy directly—a German who has survived, but landed in enemy territory. Neither man speaks English, and it’s up to the two smartest women—Greer Garson as Mrs. Miniver and Tallulah Bankhead as Lifeboat’s Constance Porter—to deal with them. Mrs. Miniver outsmarts her German pilot prisoner. At first he threatens her, and she responds with kindness. When he collapses, she takes his gun, hides it, and waits for the police to arrive—never losing her cool. In Lifeboat, we’d guess from the beginning that Constance Porter is unflappable, except where her precious camera and her livelihood are concerned, but she also happens to speak German. She translates for the stranded German, who survived after his U-Boat sank; indeed, he finds himself in the same situation as the American survivors are. And when their small boat is nearly overtaken by stormy seas, it is the German who saves the day, revealing in the process that he speaks perfect English and has understood them the whole time. It’s hard to draw conclusions about these scenes without irretrievably spoiling these films, but a huge part of their narrative success is the role-playing aspect of imagining what you’d do in a similar situation. If you were Mrs. Miniver, would you, too, be able to act decisively when it mattered? If you were Constance Porter, would you trust the German, or throw him overboard to save yourself? I mentioned above that a crucial part of my interest in these movies had to do with the fact that they came out while there was still no end of the war in sight. So how did they both fare? Mrs. Miniver was MGM’s most profitable film that year, and it still ranks on Best of All Time lists. 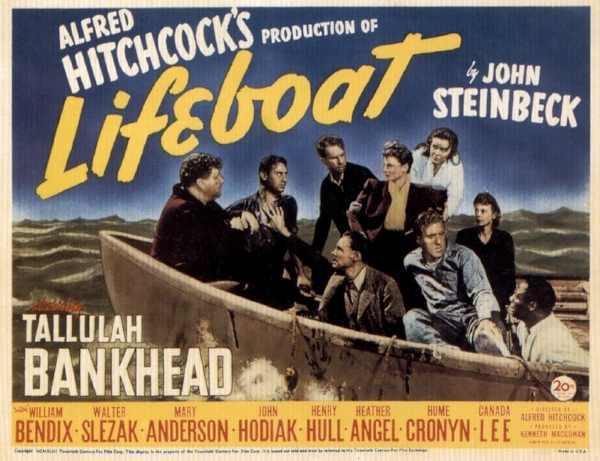 Lifeboat did not do as well—it received only a limited release, and truly can only be viewed as a success through the eyes of modern critics praising it as part of the Hitchcock oeuvre. Crowds understandably did not appreciate the portrayal of a German that was not straightforwardly evil. And yet I noticed that the print of Lifeboat I saw still had a message on the end credits to let viewers know they could buy War Bonds in that very theater where they saw the film. The ever reliable research source of Wikipedia (joking, joking) suggests that President Franklin Roosevelt rushed Mrs. Miniver into American theaters knowing that a well-timed sermon delivered in a shelled church would provide meaningful propaganda when he needed it most. It’s not surprising to me that Hitchcock would produce a movie during World War II that asked harder questions than audiences were willing to hear. What is surprising is that both of these movies feel new and creative; they’re not just films to revisit as historical research. They’re living, breathing representations of an era very different from our own, yet one that still feels relevant to a contemporary viewer. After many years of recommending movies to people, I know they don’t always listen if the movie was made before 1960 and/or is still in black and white—but these films are both deeply worth the time it takes to watch them. And if anyone wonders what I’m watching next, I have about five Hitchcock movies (2 major, 3 minor) left on the DVR to work my through. Newer PostWhere are the Art Historians in the Public Scholar Grants?